AS A PACK of hounds wait to be unleashed on the region, two special pooches celebrating the North East are among the best in breed. Northumbrian Water has sponsored two of the Great North Snowdogs, creating homes for them in city and countryside locations, ready for the launch of the ten-week-long trail on September 19. Both giant dogs have proved popular among the organisation’s employees at a sneak peek event, particularly for their success in highlighting the beauty, tradition and strengths of the region. Two artists, specially selected by Northumbrian Water, stepped out of their comfort zones to decorate the two colourful canines in homage to the areas they will be kennelled at for visitors across the region as part of the event organised by Wild in Art in partnership with St Oswald’s Children’s Hospice. “Essence of the North”, or “Essie” as she has become known among Northumbrian Water employees, is the work of artist Geoff Chappell. An engineer by trade, Geoff is a self-taught artist who has designed the armour plating, steel pipework and images depicting the region’s industrial past will bring Essie to life as she stands proud between Newcastle’s Theatre Royal and Grey’s Monument. This design resonates strongly with the water company, as water is the ‘essence of life’. Water is at the heart of health, industry and making things work and grow. Northumbrian Water’s second marvellous mutt will be make home at Leaplish at Kielder Water & Forest Park, and has been christened “Patchwork Northumberland” or “Patch”. Designed by Northumberland-based artist Daniel Weatheritt, “Patch” pays homage to the beauty of Northumberland, with his head in the dark starry skies of Kielder, his backside in the Kielder reservoir , and his mid-riff depicting the rolling hills of the county. Director of corporate affairs, Louise Hunter, said: “We fell in love with the concept of the Great North Snowdogs as soon as we heard about it. Northumbrian Water is very proud of its on-going and diverse range of activity that supports local communities and the region as a whole. Anything that adds colour and excitement to the streets of our great region, while encouraging people to get out and about and explore it has to be welcomed. Northumbrian Water’s two Snowdogs are also supplemented by two “Snowpuppies”, that it has donated to Kielder First School and Castle View Enterprise Academy, in Sunderland. Diane Nicholson, team leader and nurse at St Oswald’s Hospice, said: “We’re delighted that Northumbrian Water is sponsoring a whole pack of pooches and puppies for the trail and we’re very excited to see both Essie and Patch out exploring their new homes. The Great North Snowdogs project aims to bring together businesses, artists, schools and community groups to create a public trail of dog sculptures, based on the story The Snowman and The Snowdog, by Raymond Briggs. The trail has been designed, with sponsorship from local businesses and organisations, to showcase the rich cultural offer and artistic talent in the North East. 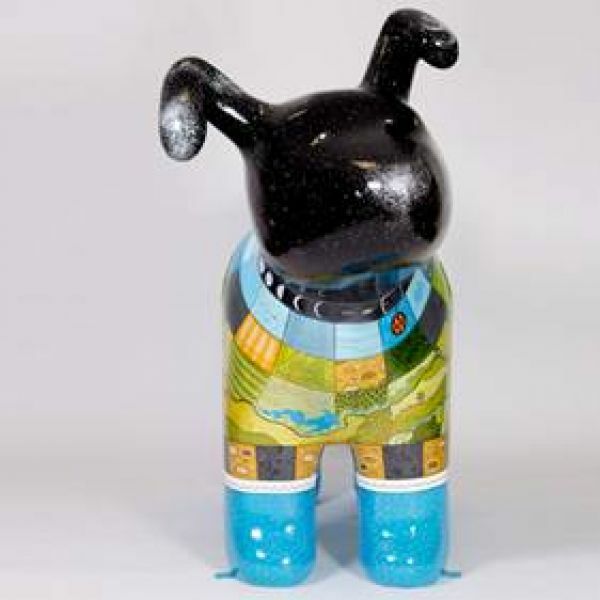 The main Snowdog trail will follow the route of the Tyne and Wear Metro and will be accompanied by a complementary trail of 97 mini Snowdogs, decorated by school children and community groups. Once the trail closes to the public in November, the large Snowdogs will be auctioned to raise funds for the hospice’s children’s services. For more information on Great North Snowdogs visit www.stoswaldsuk.org/great-snowdogs.